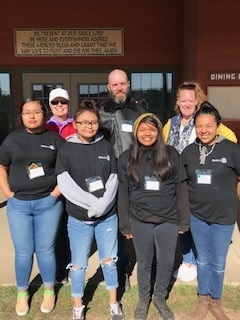 Mesa West was well represented at RYLA Ponderosa the weekend of March 29-31. Shown in the photo in the front row are the Navajo students from Pinon, Arizona who were sponsored by Mesa West Rotary. In the back row are Chris LaBarge, Robert LaBarge, and Donna Goetzenberger. The students are from the school where Robert is now teaching. Chris and Robert both served as student group facilitators, and Donna was at the camp representing and promoting Rotary Youth Exchange.